it's been a month and i just realized i haven't said anything. i was waiting until the magazine hit the bookstores here in town, and that took a while, but it is here now, at last, and i am in it, which is a pretty wonderful thing. in addition, i knew a lot of you already knew - you threw me a congratulations party, after all! - but i need to say something. i need to say thank you to jennifer who asked if i'd be interested in being featured, and christen, and everyone at stampington for putting together such a gorgeous issue, and i need to say thank you to everyone of you all over again. this is the magazine that made me believe. this is the magazine i picked up one day (almost 3 years ago) and found hard to put down. this is the magazine that was full of women who themselves were full of life and passion and truth and joy and art and words, and i couldn't put it down. a month or two later, i was blogging, and i couldn't believe it, but i was, and i haven't stopped, and now, here i am, featured in that very magazine that started it all. still hard to believe. i walked up under the ginkgo tree to take pictures amongst the leaves and it is a very bright contrasty sunshiny cold texas day and once again, the wind was blowing the pages. the leaves were too golden and too sure of themselves against the softness of my images, and so, i have softened them also. it's one of the things i talk about in this article - going where your blog leads you and today it whispered soften those leaves. i chose this image because i liked the timeline of the page. a winter photo, a summer photo, the shadow of that ginkgo leaf stem a sundial measuring the morning. i can see the words willingly follow. I just discovered this magazine myself and it was very inpspiring. It gave a new lift to my blog. I hope I've already said "Way to go!" but you weren't the only blog friend of mine featured in this issue, so I may have accidentally overlooked you. If so, mea culpa. You rock! And you are welcome all over again. =) I am still utterly thrilled for you. YAY Debi. Fabulous photo, leaves softened, whispering to me. i need to run out and get this issue....i can't wait ! and the photo, the ginko leaves.....so beautiful !! Debi, try as I might, I simply cannot find Artful Blogging anywhere in this province of mine!!! I suppose I should go online and just order it. That would be easiest. Because everytime I turn around I'm faced with gorgeous blogs being featured and I'm missing out! 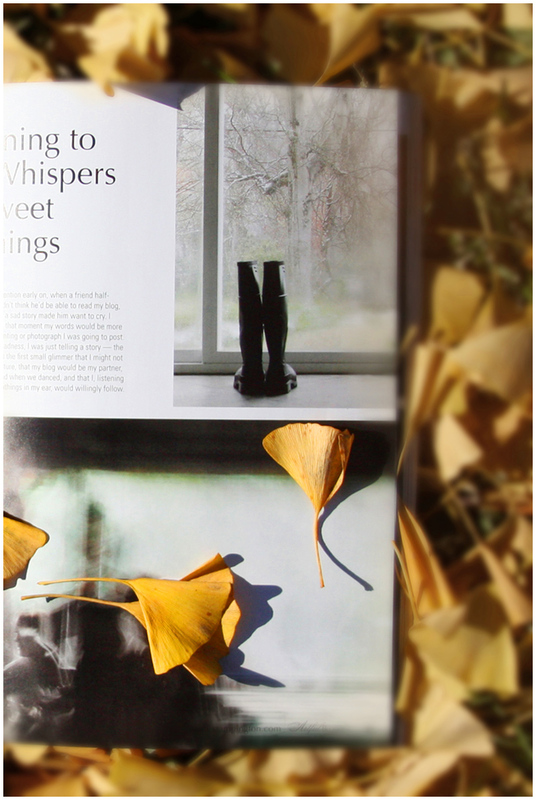 what a wonderful, exciting thing - to be featured in Artful Blogging magazine. you are so deserving of a spot there.i love that magazine ! It really is a gorgeous issue. And I will treasure it always. Beautiful article Debi. All things soft. Thanks so much for participating and writing a post about about it. It was a great pleasure working with you.